The U.S.-backed Syrian Defence Forces (SDF), dominated by Kurdish group the YPG, has killed an Islamic State operative who burned two Turkish soldiers alive, the Daily Mail reported. Talip Akkurt, known as Abu Talha al Turki, was among several ISIS members who filmed themselves burning the two soldiers after capturing them in Syria in 2015. Al Turki, on the Turkish police’s most-wanted list with a bounty on his head of 1.5 million Turkish liras ($320,000), was reportedly killed in a June 7 attack in Hajin, a small city in eastern Syria. Turkish officials and the media have so far refrained from commenting on al Turki’s death, the Daily Mail said. It is not known whether the bounty has been claimed from the Turkish police, it said. Turkey says the YPG is indistinguishable from the Kurdistan Workers’ Party (PKK), which Turkey, the United States and European Union recognise as a terrorist group. The PKK has fought a three-decade war for autonomy for Turkey’s Kurds at the cost of over 40,000 lives, most of them Kurdish. Turkey has slammed the United States for allying with the YPG and invaded Syria in January to battle the group. Turkish police had raided Al Turki’s ISIS cell in Turkey on January 27 last year, detaining six suspects. Only one of the cell members was remanded in custody by the Turkish courts, the newspaper reported. 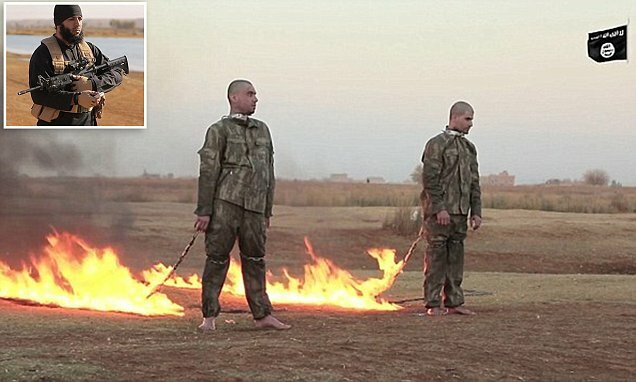 In the sick 19-minute video, released in late 2016, the two uniformed Turkish soldiers, dressed in seemingly fuel-doused camouflage army gear, were hauled from a cage and walked like dogs before being bound and torched in the desert. “They were made to stand a few feet from each other with their backs to a long fuse attached to their necks via a chain, which was ignited by one of the ISIS militants with the push of a button,” the newspaper said. WARNING: GRAPHIC CONTENT. Abu Talha al Turki has been killed by the US-backed Syrian Defense Forces (SDF). The Islamic State executioner was among thugs who burned soldiers.